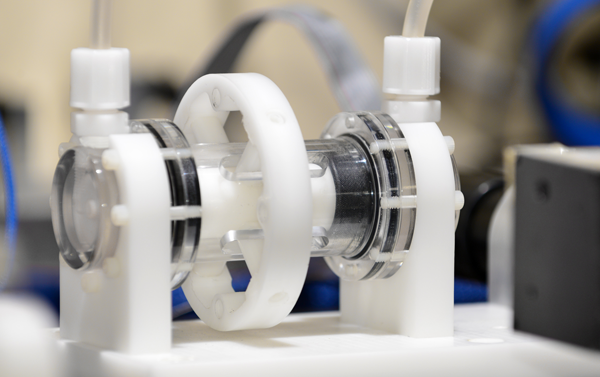 An MR-compatible motion stage is developed for simulating human respiratory motion. This motion stage is intended to serve as the ground truth for MRI motion correction technique studies. 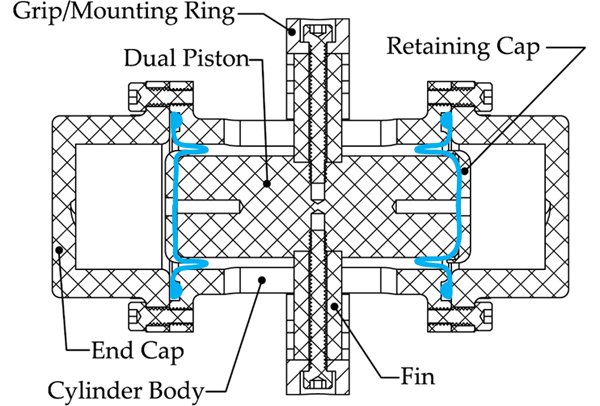 The stage (Figure 1) is composed of a driving unit, which couples the electric motor output to the fluid actuator; a motion stage, which amplifies the actuator displacement via a pulley mechanism; and a target phantom with prescribed patterns for MRI visibility. Hydrostatic transmission is chosen over a pneumatic solution for its total MR compatibility and higher bandwidth. A double-acting hydrostatic actuator (Figure 2, Figure 3) that utilizes a rolling diaphragm is designed for low-friction transmission. Via the fluid-transmission line, the non-MR-compatible components with electric drives can be isolated from the strong magnetic field in the scan room. To address the fluid-line delay, unmodelled dynamics, and the non-smoothness of the transmission, a data-based learning scheme was developed to improve the emulation of the respiratory motion. The tracking performance of the converged learning signal has sub-pixel resolution of the MRI image and approximately 0.3 mm repeatability. This motion stage can also be used for interventional studies, wherein the clinician controls another actuator pair with instruments on the end effector, to try to reach a target on the moving phantom (Figure 4). Figure 1 Motion stage configuration. Blue: hydrostatic transmission line; red: routing of the pulley amplification mechanism; green: restoring spring for pulley mechanism. Simonelli, James, et al. "An MR-Compatible Stage for Respiratory Motion Emulation." IFAC-PapersOnLine 50.1 (2017): 6073-6078. Samantha Mikaiel, James Simonelli, Yu-Hsiu Lee, Xinzhou Li, Yong Seok Lee, David Lu, Kyung Sung, Tsu-Chin Tsao, and Holden Wu. 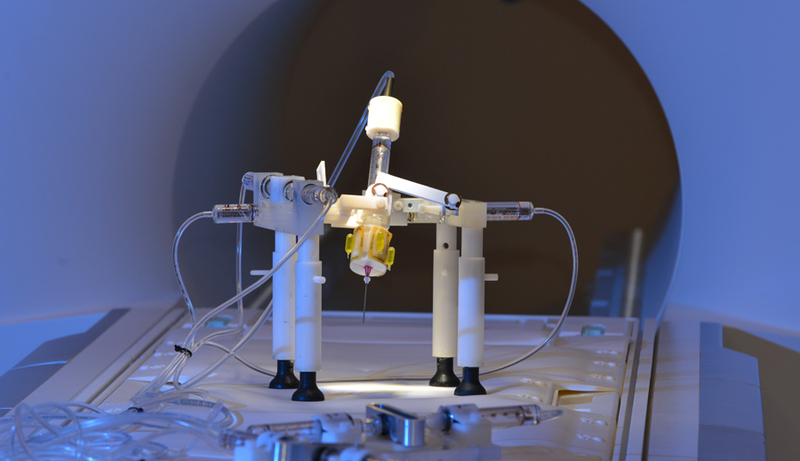 Real-time MRI-guided targeted needle placement using rolling-diaphragm hydrostatic actuators. In Proceedings of the 2017 International Society for Magnetic Resonance in Medicine Symposium. Samantha Mikaiel, James Simonelli, Yu-Hsiu Lee, Xinzhou Li, Kyung Sung, Tsu-Chin Tsao, and Holden Wu. 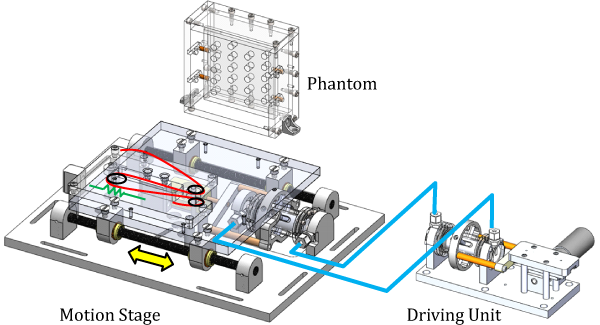 Hydrostatically actuated mri-compatible motion platform for dynamic MRI research. In Proceedings of the 2017 International Society for Magnetic Resonance in Medicine Symposium. Xinzhou Li, Samantha Mikaiel, James Simonelli, Yu-Hsiu Lee, Tsu-Chin Tsao, and Holden Wu. 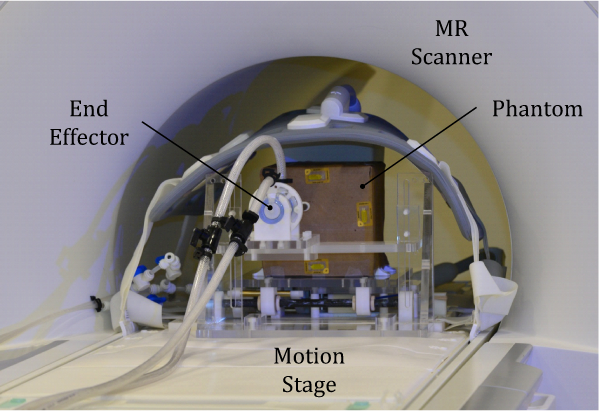 Real-time motion prediction for feedback control of MRI-guided interventions. In Proceedings of the 2017 International Society for Magnetic Resonance in Medicine Symposium.